The Flintstones & WWE: StoneAge SmackDown! Review – AiPT! James is our local WWE expert here at AiPT. Personally, I haven’t paid much attention to the art form since Junkyard Dog, Yokozuna, Gorilla Monsoon and Owen Hart still drew breath. Also, before Chris Benoit started murdering people. But I DO know some s--t about The Flintstones. Not that I’m a Flintstones enthusiast or anything, but I generally understand the timeline (it begins at The Flintstone Kids and terminates at A Flintstone Family Christmas). And because I grew up in an era where Ted Turner ruled cable boxes, you couldn’t blink without catching a Flintstones rerun (he paid for the Hanna-Barbera library and dammit, he was gonna USE it!). Fred Flintstone (Jeff Bergman) wants to take Wilma (Tress MacNeille) and Pebbles (Grey Griffen) on a vacation to Rockapulco, but he needs to raise some clams first. A series of unlikely events sees Barney Rubble (Kevin Michael Richardson) defeat CM Punkrock (ugh) at a charity boxing match. Seeing an opportunity for a get-rich-quick scheme, Fred invents the sport of professional wrestling and signs on the likes of The Undertaker, Rey Mysteriopal and John Cenastone (THEY’RE NOT EVEN TRYING). However, when CM Punkrock and his sidekick Marble Henry show up for a rematch, will Barney survive? Other WWE personalities include the Boulder Twins and Vince McMagma. I didn’t list who played the WWE characters, but seriously? I think most of you can put two and two together. I mean, they didn’t even modify The Undertaker’s name with a rock-pun. Anyway, Stone Age SmackDown! doesn’t even reach an hour in length, so for a film the thing is pretty short. That’s fine, because a little Flintstones goes a long way. More bewildering than the length, though, is just the question “why?” I mean, were there people asking for something like this? The Flintstones haven’t been utilized for anything other than Fruity Pebbles commercials since 2001 (their last TV movie). I guess you could say that they’re due for a comeback, but as a cross-promotion with the WWE? And I think that’s the whole reason I watched the thing. It’s just so utterly random; who out there was really expecting The Flintstones to bounce back from a 14-year hiatus with a straight-to-DVD movie guest starring The Undertaker? Morbid curiosity won out over “better things to do”. The plot is really stock standard Flintstones stuff. Fred gets in trouble with Mr. Slate (John O’Hurley) and has to conjure up another get-rich-quick scheme, but even after he raises the cash his greed gets the better of him and he nearly loses everything by trying to double his money. It’s the exact same setup from the beginning of The Jetsons Meet the Flintstones and the movie even acknowledges the lack of ideas by referencing those events (where Fred loses their vacation fund by trying to double it at a poker game). I mean, kudos to the writers for being honest, but this is still conquered territory. 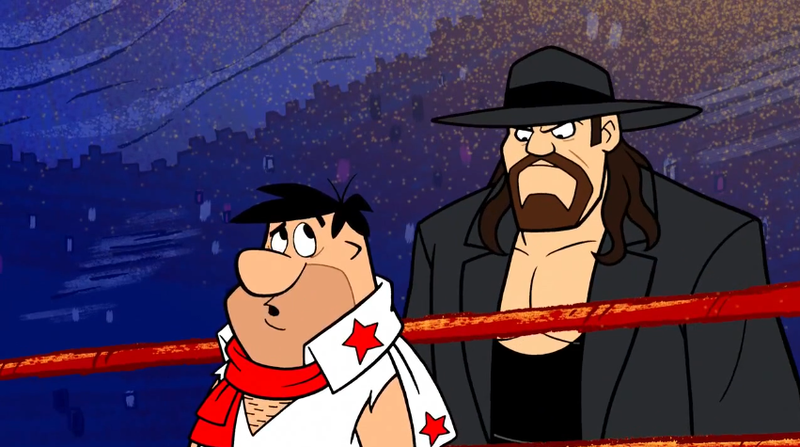 The actual WWE stuff, to the credit of the film, feels pretty organic to the plot and if all the trademarked characters were to be replaced with parodies or legal-approximations it would still feel like a sincere Flintstones story. The WWE guest stars just add some extra oomph and most of them voice act fairly well. Like I said, I’m not familiar with anybody on this roster save The Undertaker (my god, he’s still wrestling? He must be a million years old by now), but they all have pretty lively personalities. Marble Henry, who plays CM Punkrock’s sidekick, was probably the funniest of the bunch. At the other end of the spectrum is John Cenastone, whose generically heroic personality is as uninspired as the rock-pun in his name. The rest of the characters fall somewhere in the middle, though the animators seem to have the most fun visually with The Undertaker. He’s constantly drawn looking grim and frightening, but always contrasted with something silly (wearing a sombrero, reading “Sabertooth Cat Fancy” magazine, etc.). From Deadman to American Badass to…Mariachi Singer? Speaking of the animation, its probably the best The Flintstones has ever looked. When the series began way back when, Hanna-Barbera had to make the animation stiff and limited and cheap to combat budget and time constraints (a weekly animated sitcom was something new). However, as the decades passed and the visual quality of television animation improved, The Flintstones only continued to look like total s--t out of some sense of tradition or something. The Flintstones cartoons from the ’90s look just as lousy as The Flintstones cartoons from the ’60s. Wonder why they waned in popularity by the turn of the century? But directors Spike Brandt and Tony Cervone infuse a lot of life and energy into the characters, particularly their expressions, lip-syncing and body language. There’s also a lot of squash-and-stretch going on, though they’re a bit uneven in just how squashy-and-stretchy characters are at a given time. Hoppy during the charity boxing game is positively bonkers-looking on a John K.-level, but the energy in the rest of the film rarely matches that bizarreness. Still, it’s actually fun to see the characters with so many frames; it’s a rare treat for the Hanna-Barbera roster. Now, the most distracting element to Stone Age SmackDown!” is the voice casting. I just don’t understand the choices casting director Collette Sunderman made. Jeff Bergman has been voicing Fred for a few years now and his Alan Reid impression is pretty spot on, so he was a natural. I think he most recently played the character on The Simpsons/Family Guy crossover. Likewise, Tress MacNeille has been voicing Wilma even longer, since the ’90s, I think, and her Jean Vanderpyle impression (while a little too deep) is very familiar. It’s everybody else that bothered me. Kevin Michael Richardson’s Barney is going to be the hardest to get used to. I mean, I totally get what Richardson was going for with his portrayal; he was trying to capture the nasally, high-pitched voice Mel Blanc used in the first season of The Flintstones. But… why? For the 55 years Barney Rubble has existed as a character, he only sounded that way for 1 of them. Even the Fruity Pebbles commercials still use the more familiar Art Carney impression. So what was the reason for going with the obscure, almost prototype Barney voice? To put it in perspective, let’s pretend that it’s 55 years in the future and Fox has decided to resurrect The Simpsons with a straight-to-video film crossing over with, I don’t know, the PGA or something. However, the new guy playing Homer Simpson decides to base his performance off of Dan Castellaneta’s voice from the first season of the series… when Homer had that weird Walter Matthau thing going on. Wouldn’t that be weird? Wouldn’t that be a terrible choice? To not go with the familiar performance the character was known for across 99% of their existence? That’s what I’m getting at. Kevin Michael Richardson is one of the best voice actors in the industry right now, don’t get me wrong, but his choice to play the most obscure version of Barney was way off base. Even freakin’ Stephen Baldwin knew to use the Art Carney impression, jeez. Similarly bizarre is the choice to recast Mr. Slate with John O’Hurley. Now, this was a different circumstance and I can give it a bit more leeway. You see, John Stephenson was the last remaining actor from the original Flintstones cartoon and voiced Mr. Slate all the way until his death in 2012. So we have never had anybody else voice Mr. Slate except for maybe The Flintstone Kids but f--k that s--t.
But rather than try to cast someone who sounds like John Stephenson, they went in a completely opposite direction and cast John O’Hurley. Now, he plays a really GOOD demanding, ill-tempered, impatient boss character. But it’s just John O’Hurley’s voice. Well-enunciated, precise, sophisticated-sounding… it doesn’t even remotely feel like Mr. Slate. Maybe it’s because we had 52 years of the same guy voicing Slate that ANY other voice was going to sound “wrong” coming out of that character, but they really didn’t even try to find an actor who could imitate Stephenson and did a total 180. Also, Grey Griffen plays Betty with a really thick Brooklyn accent. Wha? I don’t recall Betty ever having a Brooklyn accent before. S--t, let’s just be grateful it isn’t Rosie O’Donnell. Hmmm… the fact that I spent this many paragraphs waxing on about the proper voices of The Flintstones clearly betrays my opening statement about not being a Flintstones enthusiast. I’m not, I’m really not. I’ve just absorbed way too much Flintstones knowledge through channel surfing osmosis and now I can’t remember basic algebra. In conclusion, the only thing really bringing down Stone Age SmackDown! is the inexplicable casting choices. These are all GOOD actors, don’t get me wrong, but they don’t sound right for the parts. The length is also pretty short, as I mentioned, but the movie lasts as long as it needs to. The animation received much more effort than the writing (which recycles every stone age gag you can think of, right down to the worker animals deadpanning, “It’s a living”) so it’s at least fun to look at if not to listen to. Yabba Dabba Eh. It’s okay.